You can reach this 350-year-old Brobdingnagian statue of Nandi the bull both by road or take the steps from the foot of Chamundi hills. This towering giant, is third largest Nandi in India, was Dodda Devaraja Wadiyar’s (1659–1673) gift to the city of Mysore. The monolith is carved from a single black rock and sits at a height of 16 feet and width of 24 feet. Did you know that Ravana was cursed by lord Nandi for being called bull monkey? Nandi cursed King Ravana that a monkey will be the reason of his destruction and it came true in the form of Lord Hanuman. Built in 1805, it was then used as a residence for British officials and representatives in Mysore. The architecture of the Government House is in Tuscan-Doric-style and the gateway leading to the drive is in triumphal style. Government house has a beautiful ballroom which was once used by British officials to socialise. Over a century old, it is a heritage building in Mysore that is now an open air market that features all the fresh, just harvested and local product shops. A 19th century two-story building is made of lime mortar and was built when Chamaraja Wadiyar IX was in power. It sees most of the crowd in the mornings and evenings which is the shopping hour and has more than 800 shops. Inaugurated in 1891 by the then erstwhile Maharaja Chamarajendra Wadiyar, it was the Oriental Library till 1916. Then it was renamed the Oriental Research Institute in 1943. Dedicated to research and manuscript editing, it was the first public library in Mysore, with a collection of about 75000 books and some among the rare and rich collection was Vedic Concordance, Encyclopedia of Religion and rare editions of Ramayana and Mahabharatha. It also houses some of the famous works that were preserved or published. Home of the Wadiyar family for more than 500 years, the Mysore Palace is a royal splendour with a quaint charm. 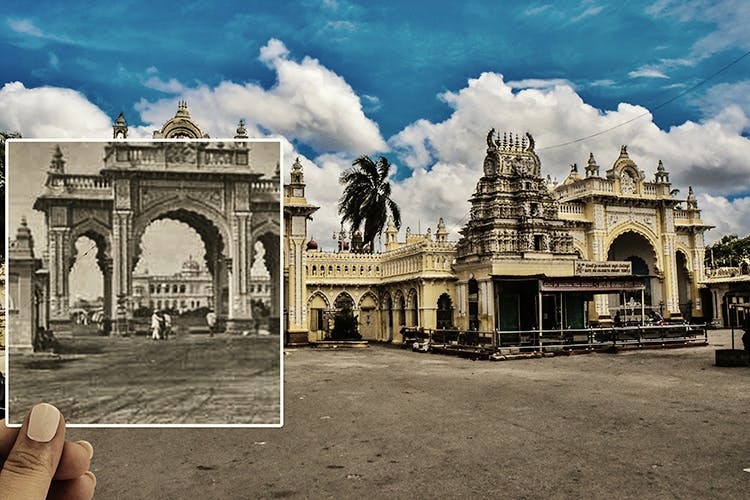 Balarama Gate is the Northern Gate of the fort and was completed during 1915–1916 and just outside are two decades old temples of Kote Anjaneya and Kote Ganapathy. One of the earliest colonial structures in the city, Wellington lodge is more than 200 years old. It was residence to Colonel Arthur Wellesley, the Duke of Wellington from 1799 to 1801, he stayed there as the commissioner of Mysore for two years. It was later used as government office and then a store associated with Government house before converting it to Tribal museum and office of Indira Gandhi Rashtriya Manav Sangrahalaya that aims at preserving traditional art and culture. The crowning glory of Mysore, Chamundeshwari temple in situated atop Chamundi Hill. It is more than a thousand years old which was initially a small shrine later built into the temple it is today. The temple is a dedication to Shakthi, the fierce form of Chamundi, who ended the demonic rule of Mahishasura. The temple found its importance after the Wadiyars (the Mysore Maharajas) came into power in 1399 A.D. Steadfast believers of goddess Chamundi, the Mysore Maharajas helped build the Dravidian-style temple, a seven-tiered gopura and golden kalashas, at the entrance of the temple. Also known as summer or pleasure palace, the Lokaranjan Palace is one of the oldest palaces in Mysore and was built between the years 1850–60 by HH. Sri. Mummadi Krishna Raja Wadiyar. The entrance to the palace has beautiful arched gates. The palace was opened to public and used as a royal school for many years at the time of HH. Sri. Chamarajanedra Wadiyar. This was the palace where Maharaja Jaya Chamaraja Wadiyar had held his first press conference in Mysore. This post first appeared on Royal Mysore Walks. Read it here.